Borrowing and lending for commercial real estate deals is hardly dead in the water, but it is not as active as it was only a year or two ago, as interest rates have crept up and transaction volumes are down. Essentially, there is a more conservative mood in the capital markets, according to the speakers at our Orange County Capital Markets & Investment Forum. Both borrowers and lenders are feeling it, especially as the outlook for rent growth in multifamily is not as robust as only a few years ago. Despite the more conservative mood, new players are trying to squeeze into the game. One recent development in CRE lending is the rise of large debt funds aiming to take up some of the slack caused by more conservative attitudes among banks and other lenders. multifamily and renovates it, said agency lenders were extremely active about four years ago, and banks were lending at 65% loan-to-value and 250 basis points over Libor. That was the universe of lenders for value-add acquisition loans. "Today, you see an explosion of lending among the Blackstones and Starwoods of the world," Fink said. "They're out there raising big debt funds. The big banks aren't as aggressive or active as they once were. For one thing, they have debt-yield tests that are harder to get over." The debt funds are lending at 65% to 75% bridge loans in the range of low-300 basis points over Libor, Fisk said. KBS Realty Executive Vice President Finance Robert Durand, whose company specializes in office projects with relatively low leverage, said as interest rates have gone up, spreads have come down. "The market for higher-leveraged deals, which involves transitional assets at 65% to 70% leverage, has gotten very competitive in that last 12 months," Durand said. "As banks have become a little more conservative, a lot of other players have come into that space. It's been an interesting transition to watch." Farmers & Merchants Bank Senior Vice President and Regional Relationship Manager Kathy Reed said her bank lends across the board, but also has a niche in nonprofit. As such, Farmers & Merchants is not facing such stiff competition from debt funds. "Our borrowers are high net worth individuals and smaller developers," Reed said. "From four years ago to today, our underwriting hasn't changed. We're still a conservative, low loan-to-value, 50% to 60%." Rialto Capital Director, Commercial Properties Group California Jeremy Griffin, whose company has about $5.5B of assets under management, said in 2012 and 2013, Rialto took a little more leverage in its deals than now, because there was higher projected net operating income growth in those days. "We pushed the envelope in a few deals, up to 70% to 75%, but as the cycle has progressed and is getting longer in the tooth, we've ratcheted that down accordingly," Griffin said. "In office and industrial, we cap out at about 65%, and 70% in multifamily, so that means we're talking mainly to banks and a few debt funds that can offer attractive pricing." Pacific Life Insurance Co. Managing Director of Commercial Mortgage Investments John Waldeck, whose company specializes in large construction loans, said the market for that kind of lending is not so different now than four years ago, though there is more competition. "Where we add value to our portfolio isn't in risky, high-yield plays, but in loans that are a little more than an industrial loan that's, say, getting 145 over Libor or less," Waldeck said. "There are more lenders entering into construction lending, and that's where competition is driving down rates. Now it's less obvious where your next deal is coming from." Buchanan Street Partners co-founder and President Timothy Ballard said his company has two kinds of customers: large pension plans that have a lot of capital, but are reluctant to deploy it because they are a little worried about the future of the economy, and high net worth investors looking for more opportunistic deals. "High net worth investors want yields that they can't find in their other investments, so they're eager to be in real estate, and if they can get a 6% to 7% cash dividend, they're excited about that," Ballard said. Transaction volume has been falling in the last year or so. "The institutional investors are cautious. They're defensive and piling up cash," Ballard said. "The projections are that transaction volumes will continue to drop, because owners are rewarded for not selling. I've seen that over and over." LBA Realty Vice President, Acquisitions Mike Johnson said his company, a private REIT, has two funds: one an opportuntistic fund that acquires industrial and office, the other a fund that focuses on core industrial. "There's a lot of capital chasing the same deals, so it's a challenge to find deals and close them, but we're finding opportunities. We're also realistic sellers." Johnson also said there is a massive consolidation going on within the industry. "On the industrial side, there are core funds that don't sell," he said. "As they acquire properties in one-off deals from private owners, it's that much more product that's taken out of the marketplace." USAA Real Estate Co. Managing Director Steven Ames said his company has seen a lot of growth, with about $20B in properties under management and funds that cover the entire capital stack. The company has sold about $10B in real estate assets over the last four years, but even so has grown. There are reasons for caution now, Ames said. "We're in the second-longest growth cycle in history, about eight years. There's rising interest rates, slowing rent growth, geopolitical uncertainty — a lot can happen quickly to slow down growth. Also, the country has spent the last year watching the train wreck of our politics." "We're looking for investments that can weather the downturn, because there are always downturns." Green Street Advisors Managing Director, Strategic Research David Bragg, whose company does research across the country and in all property sectors and also has an advisory and consulting group, said there is great disparity in real estate valuation now. "We're seeing retail values declining in the last year, especially in the low-quality mall segment, and rising values in industrial real estate. Those are the two standout sectors." the quality of the mall. For Class-D and C malls, it is likely that many of them will not exist in the near future. The valuation of the top 1,000 malls, by contrast, is strong. "Our favorite sector, and it has been for some time, is manufactured housing, which is highly fragmented and undervalued. There are a couple of high-quality manufactured housing REITs that we think very highly of." Bragg said e-commerce, Airbnb and the transportation revolution are key considerations that will affect certain property sectors in the future. 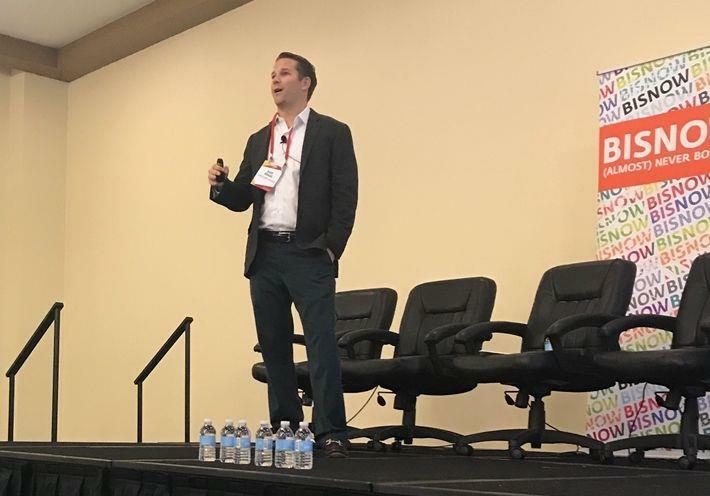 The outlook in terms of asset values for various niche sectors, such as data storage, net lease, self-storage and manufactured housing, are generally better than more mainstream property types, except for industrial, he said. Declining values are expected for malls and office. Developers should build in markets that will absorb new construction pipelines adequately because, in some markets, rents are now softening as supply is exceeding demand, Buchanan Street Partners’ Tim Ballard tells GlobeSt.com. 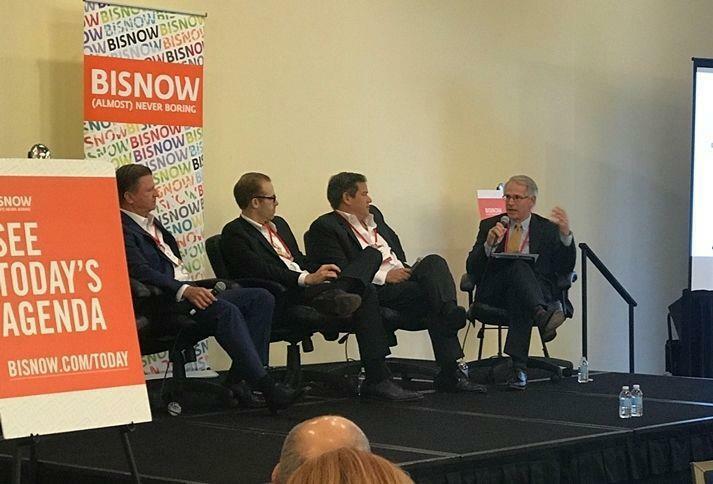 NEWPORT BEACH, CA—Apartment developers should make sure to build in markets that will absorb new construction pipelines adequately because, in some markets, rents are now softening as supply is exceeding demand, Buchanan Street Partners’ president Tim Ballard tells GlobeSt.com. Investors looking to maximize ROI in real estate have historically considered financing multifamily developments, but Buchanan Street Partners has seen various shifts that investors must consider prior to making a deal, Ballard says. Buchanan recently began a $50-million age-restricted, multifamily development in the Greater Salt Lake City area. The property, once complete, will meet provide upscale amenities, pleasing views and access to retail and public transportation. In addition, Buchanan Street has activated a programmatic effort to expand the company’s multifamily investment portfolio by investing $500 million in multifamily projects in three years. We spoke with Ballard regarding the multifamily market, how he views its current state and strategies for other investors. GlobeSt.com: How would you characterize the current state of the multifamily market, and what are your predictions for 2018? Ballard: The multifamily market is starting to show signs of weakness in some of the major markets, but continues to attract massive capital flows. The last few years have brought a flood of new multifamily construction projects. As a result, the sector is likely to see a softening of rent growth in markets that have high deliveries. Despite increased vacancies in some of the primary markets, there are many secondary markets that continue to demonstrate strong fundamentals. GlobeSt.com: What tips do you have for choosing the right multifamily developments for your investment? Ballard: Make sure you build in markets that will adequately absorb new construction pipelines. Many of the gateway-city markets, like San Francisco and New York City, have seen significant new development. Rents are now softening as supply is exceeding demand. Conversely, while some secondary markets have seen less new development, we are still seeing strong population and job growth in cities like Salt Lake and Denver and are attracted to those markets. There has been a lot of talk about Millennials never wanting to buy a home and creating product to serve their predicted demand. This has resulted in significant development of smaller units in urban environments that cater to this population. We believe there is a risk that too much of this product is being delivered. Furthermore, like every generation before them, Millennials will ultimately want to purchase homes in good school districts for their families. Many of the urban developments don’t have the benefit of desirable school districts or the environment that families will likely seek. We are also seeing a growing contingent of older renters by choice that are seeking higher-quality finishes and amenities. This has created an opportunity in improving the current apartment stock since many assets, even as new as 10 years old, do not reflect the preferences of these renters. GlobeSt.com: How can investors increase ROI on multifamily transactions? Ballard: Multifamily developments can be profitable investments, but there are several things investors must keep in mind. Assuming you get the big things right—location, quality asset and strong local market fundamentals that are consistent with your underwriting—it then becomes all about execution of the little things. Factors that come to mind are unit finishes and amenities consistent with tenant demand, technology integration that benefits tenants (i.e., package management, smart thermostats, security, etc.). As an example, energy-efficient upgrades not only reduce operating costs but also result in significant financial savings when using agency debt. Package management is a great example of changing needs. Today’s tenants receive many package deliveries—much more so than just three years ago. Many communities don’t have adequate ways of managing the influx of deliveries. Leasing offices are often closed when tenants get home from work or packages are delivered to front doors, resulting in an increase of theft. There are vendors like Parcel Pending that have developed innovative solutions to this growing problem. GlobeSt.com: What are some common mistakes you see multifamily investors make? Ballard: It’s easy to make mistakes with any investment, but there are a handful of things that are very important to get right. Is there too much capital in your target market? If so, you often see investors making unrealistic growth assumptions and “playing with the numbers” to make a proforma appear attractive on paper. Will cap rates hold? In some of the major markets where cap rates have dropped into the 4%-or-less range, a 1% increase would result in a 25% lower residual value, potentially crushing your returns. Make sure you adequately underwrite capital costs. Often investors assume that a standard $250-per-unit capital reserve is adequate when in reality it costs far more to keep your property in good condition as well as to remain competitive. Rents don’t always grow. The normal proforma I see has 3% to 5% rent growth forever. We are late in the cycle with a lot of new construction. I am sure that we will see periods of time over the next decade where you see a flattening of rents on a good day with a decline of rents likely in many markets during periods of economic contraction. HOUSTON—Although many were not so lucky, Buchanan Street Partners and Boxer Property report that office assets did not sustain any flood damage and give high praise to property management teams for heroic efforts. Before Hurricane Harvey, there was increasing opportunity in Houston’s office sector as a result of the distress in the energy sector, according to Buchanan Street Partners. After Harvey, how are those investments holding up? The three properties owned by Buchanan Street Partners are Sam Houston Crossing II, the Offices at Kensington and 2100 W. Loop South. Sam Houston Crossing is a 160,000-square-foot office building located at 10344 Sam Houston Park Dr. that was acquired by Buchanan earlier this year. The property has frontage along Texas-8 Beltway between US 290 and State Highway 249, in a location central to housing ranging from entry to executive level. Buchanan Street Partners acquired the Offices at Kensington, a two-building class-A property in Sugar Land, TX in 2012. The 170,774-square-foot office property, located at the intersection of State Highway 6 and US Highway 59, has a 10-year occupancy average of 92%. It is located on a 15-acre lake with decorative fountains, 2-1/2 mile walking path, and has covered and uncovered parking with on-site property management in First Colony. 2100 West Loop South is a 16-story class-A office property located in the Galleria. This retail and entertainment complex offers dining and shopping, hotels and athletic facilities. The 16-story property has 162,336 square feet of space, with the typical floor plate at 10,500 square feet. The West Loop South asset was built in 1974 but renovated in 2014. In addition, Houston-based commercial real estate firm, Boxer Property, is also open for business at 95% of its 58 Houston properties. After its first priority to confirm the safety of all Boxer employees, property assignments were made to inspect property grounds and buildings for flooding and water damage. With some special logistics planning, management and maintenance staff made adjustments to their regular assignments to assess properties close to their homes or from accessible freeways. As of early last week, all properties had been inspected to ensure the safety and availability for customers to return to work. Boxer Property recognizes that many other businesses have been impacted by the flooding and has made special pricing and short-term office space available for those displaced by Harvey. Helping the community stay safe and recover is its priority, the company says. 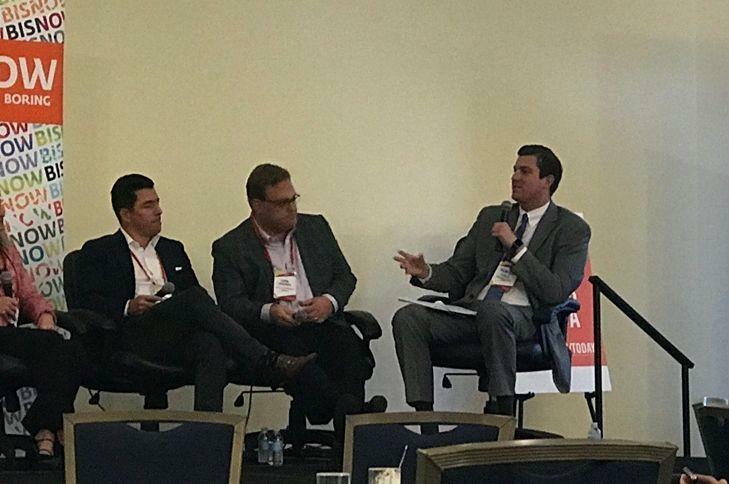 Last week, Connect Media wrapped up our third annual Connect Orange County event with a panel of “Power Players.” The group included Trammell Crow’s Tom Bak, Buchanan Street Partners’ Robert Brunswick, HFF’s Kevin MacKenzie, and CT Realty’s Watty Watson, with NKF’s Greg May as the moderator. NKF’s May spoke to the changes in the market’s clientele, as the mortgage industry or related companies now compose just 30% of the deals, as opposed to their 60% composite in 2007. Trammell Crow’s Bak communicated that as of now, the Inland Empire is proving to be a sought after market, with demand getting larger and larger. He noted that along with the Inland Empire, office and industrial projects are peaking his interest as of now. On the office side, that’s translated into activity in markets such as Seattle and San Francisco. On the industrial side, e-commerce is the biggest driver. Buchanan Street’s Brunswick conveyed the reliability of secondary markets such as Denver, Phoenix and the Inland Empire in terms of cash flow. He also noted that money managers are advising clients to invest in alternatives and real estate. There is a shift towards unlevered structures, and that’s resulting in lower levered deals than the last cycle with risk removed, although buyer behaviors and expectations have changed too, he notes. When discussing recent market trends, HFF’s MacKenzie says they’ve seen increased activity in the 1031 Exchange market in “bite-sized” deals in the $5- to $30-million range. There’s also been an increasing amount of all-cash buyers at the $50-million level. CT Realty’s Watson described investments being most lucrative in tier 1 distribution markets, where 6 to 7 markets are at the center of everyone’s focus. He also stressed the importance of e-commerce’s prominent role in today’s markets. 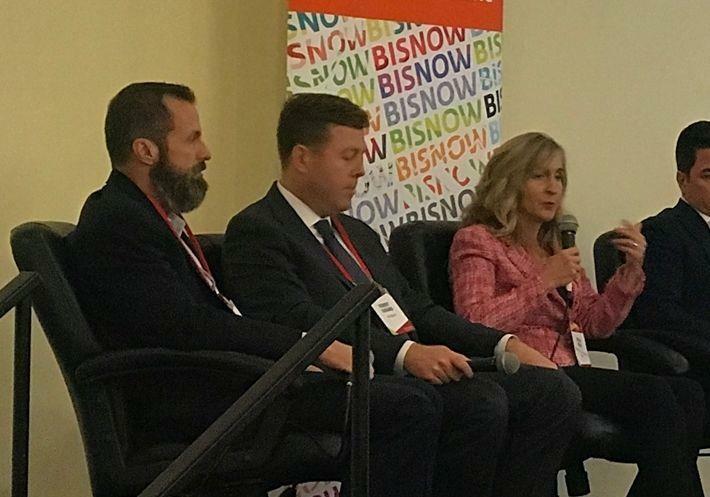 When all of the panelists were asked to give advice to the next generation of CRE leaders, they unanimously stated that strong communication skills, especially written, were critical to succeed in today’s commercial real estate sector. NEWPORT BEACH, CA—In many coastal California markets, there is a tremendously deep investor base focused on California, often resulting in pricing that has outpaced fundamentals, Buchanan Street Partners’ president Tim Ballard tells GlobeSt.com. As we recently reported, the firm has purchased a 224,000-square-foot transit-adjacent office tower in Denver’s largest office submarket and is eyeing other markets outside of California. We spoke with Ballard about what is drawing the firm to these other markets and what their buying strategy is for these other regions. GlobeSt.com: What is attractive about investing in markets outside of California? Ballard: We are focused on markets that offer a combination of strong local economies and pricing levels that offer attractive risk-adjusted returns. The challenge in many coastal California markets is the tremendously deep investor base focused on California, often resulting in pricing that has outpaced fundamentals. There are two important trends that I believe are causing this. Foreign capital continues to increase its investment in US markets. However, as we have seen in past cycles, this capital rarely moves beyond the coasts. Combine that with the continued growth of mega real estate funds that have $2 billion to $15 billion of equity that are primarily focused on the largest markets where they can deploy capital into large assets, and you can see the result of all of this capital pushing into the California coastal markets. We are concerned that this is not sustainable over the long term. GlobeSt.com: What attracted you to 5613 DTC in Denver? Ballard: There are three primary attributes that make Denver and this recent purchase an attractive investment. First, the region continues to have strong job growth, which results in tenant demand. Next, we have a value-add strategy for 5613 DTC. This is a vintage 1980s building that we purchased at approximately half of replacement costs. It has not had the necessary capital to compete with newer, class-A product in the region. We intend to improve the building significantly to bring it up to class-A standards. Lastly, one of the most attractive attributes of this building is that it is transit oriented and situated in an excellent location. 5613 DTC is adjacent to a light-rail station in one of Denver’s premier business parks. The immediate office submarket is the largest in the Denver metro and anticipates completion of a $1.5 billion mixed-use project that will continue to increase the attractiveness of this location. GlobeSt.com: Which other markets are you eyeing, and why? Ballard: There is still a lot of opportunity to find quality assets at good prices where we can execute a business plan that adds value to the investment. While we are still active in some California markets, we continue to look for additional opportunities in Texas, Phoenix, Denver and Salt Lake City. GlobeSt.com: What else should our readers know about your investment strategy for 2017? Ballard: As we enter into our 18th year, Buchanan Street continues to innovate and seek new investment opportunities for our diverse investor client base. In addition to direct acquisitions, we continue to look for bridge-lending opportunities in the West in the $5-million-to-$25-million range. We fill a void for transitional properties or assets that need rapid execution. We will also be more active in the multifamily investment space in Salt Lake City and Denver. HOUSTON—There is optimism due to a diversified economy beyond energy resulting in net positive job growth during the last 18 months, a rebound of the energy sector will stimulate added job creation and population in the region is increasing. There is an increasing opportunity in Houston’s office sector as a result of the distress in the energy sector. Although the energy sector has recovered significantly, valuations have dropped materially, according to Buchanan Street Partners. Amid that increasing opportunity and optimism, Buchanan Street Partners has acquired Sam Houston Crossing II, a 160,000-square-foot office building located at 10344 Sam Houston Park Dr. The seller was Duke Realty and the price was undisclosed. Sam Houston Crossing II is a three-story office building that is 100% leased by subsidiaries of Forum Energy Technologies, PEMEX and First American Title Company. The property has frontage along Texas-8 Beltway between US-290 and Texas State Highway 249, in a location central to housing ranging from entry to executive level. “The market surrounding Sam Houston Crossing II is becoming an increasingly popular employment hub in Houston because of its central location to a wealth of housing. Large companies are making office decisions based on location and are attracted to this region because it can minimize employees’ commute times and appeal to a larger percentage of the workforce,” said Haugen. This is Buchanan Street’s sixth acquisition in Texas in the last 24 months. Buchanan Street plans to seek opportunities in Houston and anticipates actively acquiring significant assets in Texas in 2017. “Buchanan Street is optimistic about Houston’s office market because of a couple of reasons: The business community has diversified beyond energy, resulting in net positive job growth during the last 18 months even though the number of energy jobs fell, a rebound of the energy sector will stimulate additional job creation during the next 12 to 18 months and drive absorption in the area, and there’s a growing population in the region,” Haugen tells GlobeSt.com. Jared Chua of CBRE represented the seller in the transaction. Buchanan Street represented itself. As previously reported, year-end 2016 total office leasing activity settled at 8.9 million square feet, down significantly from 18.4 million square feet in 2014. 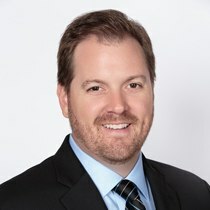 NEWPORT BEACH, CA—The CRE finance market is watching to see whether the Trump administration will advocate changes to Dodd-Frank and how those changes could impact the securitization and banking side of the market, Buchanan Street’s Matt Doerr tells GlobeSt.com. The commercial real estate finance market is watching to see whether the Trump administration will advocate changes to Dodd-Frank and how those changes could impact the securitization and banking side of the market, Buchanan Street Partners VP Matt Doerr tells GlobeSt.com. The firm recently provided a $16-million loan to refinance 21845 Magnolia St., a 29‑acre industrial facility in Huntington Beach, CA, recently purchased by subsidiaries of Shopoff Realty Investments. The loan represents the company’s ongoing strategy to provide reliable bridge financing for value-add real estate. Buchanan Street also recently provided an $18-million loan to a major Los Angeles-based development firm for the acquisition of an existing shopping center in Granada Hills, CA. The loan was funded through Buchanan Street’s proprietary bridge lending platform and provides additional funds for interest, pre-development expenses as well as “good news” funds if entitlements are secured. The borrower recognized the attractive in-place zoning, which may permit high-density commercial and multifamily use. The “by‑right” zoning designation greatly enhances the site’s redevelopment appeal. Lastly, Buchanan Street continues to expand by recently adding Chris Cervisi as assistant VP to its debt-investments team to meet its growing business and market demand. Cervisi joined the team last month with more than eight years of experience structuring equity and debt and is responsible for sourcing, structuring and underwriting real estate debt investments. In his previous role, he was focused on office and retail acquisitions and asset management, including underwriting, market research, business-plan formulation, reporting of fund investments and dispositions. We spoke with Doerr about these two transactions and the hiring of Cervisi, how they all relate to the company’s strategy going into 2017 and where he sees the private-lending market heading. GlobeSt.com: How are the refinancing of the Huntington Beach industrial/land property, the acquisition loan for a San Fernando Valley shopping center to be redeveloped and the addition of Chris Cervisi related to your company strategy? Doerr: These most-recently funded loans and the hiring of Chris are tangible indications of not only our platform and personnel growth, but the positive reception of the Buchanan Street brand within the bridge-lending business. These loans specifically affirm our Western US regional focus and adaptive structuring capabilities in customizing varied loan solutions. Chris’s diverse background on both the equity and debt side of the ledger allow us to further build out our talent base to serve our broker and direct borrower relationships. GlobeSt.com: What type of growth do you envision for your company in the next year? Doerr: Since our company’s inception of the mortgage-lending business, we have continued to grow our active pipeline and loan closings, which point to an increased production year for us in 2017. Anecdotally, we have seen a significant increase to our pipeline within the past 60 days aligned with the recent uptick in interest rates. In addition to our bridge lending, we also provide institutional mezzanine capital for larger projects. Both products are becoming more active within the construction lending area where banks have been negatively impacted by the increased regulatory environment. GlobeSt.com: How do you see the future of the private-lending space? Doerr: We believe that the private-debt-capital space will continue to capture more market share in the wake of HVCRE rules and other regulations. The CRE finance market is watching to see whether the Trump administration will advocate changes to Dodd‑Frank and how those changes could impact the securitization and banking side of the market; however, it’s unlikely that any changes will occur in 2017, and regardless, there will always be a need for predictable private capital to meet varied and customized borrower demand. There continues to be a need for capital that can provide structuring flexibility, responsiveness and certainty of execution. We pride ourselves on our discretionary, efficient and expeditious closing process. Doerr: As we enter into our 18th year, Buchanan Street continues to innovate and develop new investment products for our diverse investor client base. It is evident that real estate is becoming a significant part of an investor’s asset allocation, with its ability to offer fixed-income characteristics while providing tax advantages and an inflationary hedge. Accordingly, we are continuing to explore new property segments for portfolio diversification to satisfy our increased client demand. Just how big is the middle market? NEWPORT BEACH, CA—Most people may not know that roughly 70% of commercial real estate is valued at $40 million or less, Buchanan Street Partners’ Matt Doerr tells GlobeSt.com. Doerr was recently appointed VP of the firm to lead the company’s growing bridge-loan platform under Buchanan Mortgage Holdings, the company’s proprietary lending business. His appointment comes at a time of increased lending activity, following the recent closing of three loans totaling $30 million. We chatted exclusively with Doerr about the firm’s bridge-loan program, which accommodates the middle market of commercial real estate financing. GlobeSt.com: WHAT DO YOU HOPE TO ACCOMPLISH IN YOUR NEW ROLE WITH BUCHANAN STREET PARTNERS? DOERR: First off, I was very excited about joining Buchanan Street because they have a great reputation and history as an active capital-markets participant in both the debt and equity space. What was appealing to me was their creativity and full capital-stack conversancy, and the opportunity to help lead and build the debt platform. My goal is to further Buchanan Street’s lending brand and presence within the western states and position our platform as a leading bridge/construction lender among sponsors and intermediaries. In this regard, we consider "sponsors" to be borrowers that are bringing forth a portion of equity and seek a larger portion of debt. Likewise, "intermediaries" is our term that represents the brokers that are in search of capital sources on behalf of borrowers. Moving forward, I hope to educate intermediaries and help them further their capital-solution options to their clients. GlobeSt.com: TELL US ABOUT THE FIRM'S BRIDGE-LOAN PLATFORM AND WHY IT'S EXPANDING. DOERR: Interestingly, most people may not know that roughly 70% of commercial real estate is valued at $40 million or less, within what is considered the “middle market.” We have built our bridge lending practice to accommodate this significant borrower base and believe that private lending with an institutional-quality experience will be in great demand. That’s the backdrop, but more specifically to the current lending environment, Buchanan Street continues to see dislocation in the middle-market CRE lending space that is driven by an evolving regulatory environment and is impacting not only regulated banks, but also CMBS issuers and investors. As Dodd-Frank and Basel III implications continue to play out, more and more CRE owners/developers will seek flexible-debt platforms to provide reliable, custom-tailored capital solutions. Specifically, our product caters to a $5 million-to-$25 million loan request that can accommodate quick-close, bridge, acquisition and construction needs. GlobeSt.com: WHAT INVESTMENT TRENDS DO YOU SEE EMERGING? DOERR: We’re still seeing experienced sponsors find interesting and accretive real estate investments, so opportunities do exist. However, finding reliable and predictable acquisition or bridge capital has been a challenge, given some of the reasons I mentioned. Well-capitalized and responsive lenders can add value by offering thoughtfully structured quick-close capital or by providing non-recourse construction financing to experienced developers. Lately we’ve seen the small- to middle-market construction financing market really tighten, which has pushed more requests to private lenders. For example, industrial real estate in the Inland Empire is in high demand right now. If a developer wanted to build industrial and could commit 25% of the construction costs, a few years ago a bank could have provided that financing. Now, because of HVCRE regulations and other drivers, a developer in this situation is likely to source non-recourse capital in the private lending space. GlobeSt.com: WHAT ELSE SHOULD OUR READERS KNOW ABOUT PROPRIETARY LENDING? DOERR: We are a significant real estate owner and operator ourselves, typically on larger asset sizes, and therefore we are an active user of debt. So, we have built a lending platform that’s responsive to the broader CRE capital market environment, yet engineered to be flexible and provide sponsors and intermediaries with the certainty of execution that you need from a bridge lender. In today’s market, it’s important to understand a lender’s level of discretion over their capital and their approval process. Sponsors and intermediaries should be aware that opportunities to secure bridge capital still abound, and they should align themselves with a proven lender.